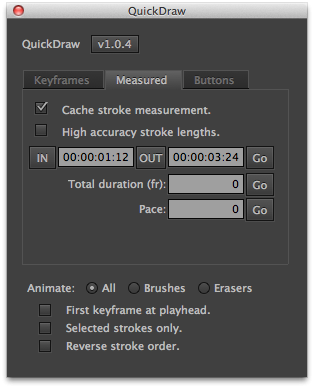 QuickDraw provides a number of tools to create and manipulate keyframes for individual strokes drawn using the built-in Paint Effect. If you're handy with a Wacom tablet or even drawing with your mouse, once you've traced your source text layer or line drawing QuickDraw makes the animation and timing process a piece of cake. Faster and more stable method for stroke measurement. 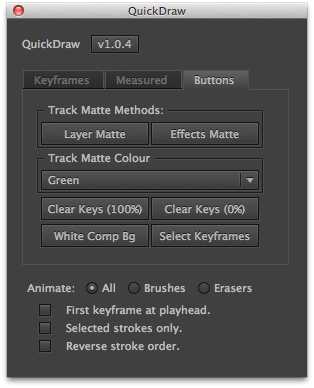 Painted layers with expressions and keyframes are managed when creating a parented Track Matte layer. Choose the colour of the generated Track Matte layer. 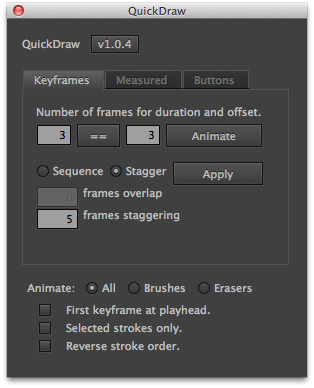 All QuickDraw options are saved to your After Effects preferences. Each stroke in a Paint Effect has animatable properties including an "End" property. By setting two keyframes at 0% and 100% the stroke is drawn on. QuickDraw is a collection of methods for setting and manipulating these keyframes. Equal duration and frequency - one click. Sequencing of existing keyframes (most useful after tweaking preset keyframes), with options for overlap or padding. Keyframes set between IN and OUT points on the Timeline with keyframe spacing proportionate to stroke length. High accuracy stroke length measurement option - default method counts the stroke vertices, the other sums segment lengths. Calculated stroke lengths cached in Stroke name (saves recalculating when experimenting with timings). 2 track matte options - via duplicate layer or alternatively achieved in Effects stack. Set keyframes from playhead position (default is from layer in point). Select strokes in the Timeline or Layer Viewer and animate selected only. Filter strokes by Brush or Eraser type (based on stroke names). This series of videos done for the Rental Tenancy Authority are a prime example of QuickDraw in production. This series of videos done for the Rental Tenancy Authority Queensland are a prime example of QuickDraw in production. Compatibility confirmed with CC 2019. Licensing framework updated. Compatibility confirmed with CC 2015. 1.0.3 - Main fields and settings persistent between sessions. 1.0.2 - Embedded logo removed to prevent possible error. Quick layout change.